While killer animal movies are among the most popular and prevalent horror offerings being produced today, very few are actually remembered as classics. Really, there’s Jaws and that’s about it. Most of the titles we remember fondly were done immediately on the heels of Jaws with much less time and money than what Spielberg’s movie had to work with. Alligator and Piranha are both excellent in their own way, but both show their budget and work because they embrace their own sleazy, B-Movie nature. Since the early 2000s, this kind of feature has gotten a bad rap because 99% of the sub-genre’s output in that time was produced by the SyFy Channel. But if there’s one movie in the animal attack sub-genre that could stand on the same platform as Jaws if not directly beside it, it’s Lake Placid. Yes, it can be campy at times, but that humor is extremely intentional and incredibly smart on the part of the filmmakers. This brings me to another, simpler reason I love Lake Placid so much: I think Steve Miner is a hugely underrated director. Friday the 13th Part 2 and Part III are almost always listed as being among the best of that franchise and there’s actually some filmmaking talent on display in them, particularly Part 2. House is one of my favorite ‘80s creature features and probably one of my favorite horror comedies ever. Halloween H20, in my eyes, is among the most underrated slashers of all time, particularly for its decade. Sure, Miner might be notorious for ignoring continuity any time he steps into an established franchise, but he nonetheless directs a good movie. And that’s exactly what Lake Placid is. The premise is absurd and doesn’t do anything to separate it from the creature features of the late ‘70’s and early ‘80’s, but to be honest, it doesn’t seem like Lake Placid is even looking to separate itself from them anyway. The best thing about the film is the amount of fun it has with what it is. But it’s elevated in the sense that it’s a sleekly made, well paced and genuinely effective movie at the same time. Right up front, I’ll admit that it’s a help that Lake Placid is working with a lot more money than the likes of Alligator or Orca. It allows for a great cast including Bill Pullman, Oliver Platt and Betty White; it allows for sleek, stylish cinematography, and it allows for some pretty damn excellent practical effects. By the end of the ‘90’s almost all horror movies were devoted to pointing out the tropes, trappings and—in the more cynical features of this cycle—the genre’s inherent stupidity. Considering the climate in which it was made, Lake Placid is a breath of fresh air. It’s not about being smarter than the genre, it’s just about having fun with a ridiculous monster movie. The feature is completely over-the-top but, weirdly enough, in a way that feels almost natural. It provides the audience with a sense that anything could happen at any time, which is generally what you want from a horror movie. It also helps the numerous surprises that, fitting as they might seem, make the overall plot make even less sense. If one giant crocodile living in a lake in Maine is absurd then, naturally, two is twice as absurd. But it’s hard to be concerned with such trivial details because, to me, that ridiculous, heightened nature is the whole point of the film. 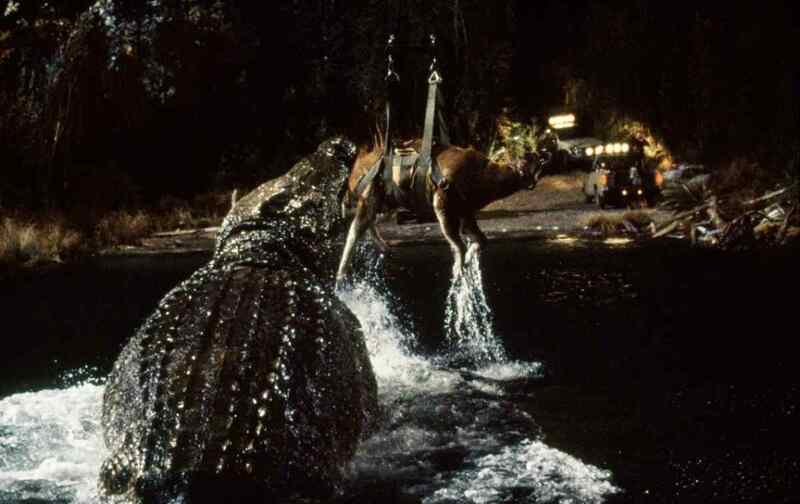 On that level, Lake Placid came out at the perfect time, when so many other pictures of that type were being made—titles like The Relic, Anaconda, Deep Blue Sea or Emmerich’s remake of Godzilla that all tried and failed to elevate their genre. Lake Placid is not concerned with that and is all the better for it. By your typical horror standards, it’s almost completely tame. The R rating is for language more than anything else. The CGI is cartoonish but much more underplayed than some of its contemporaries, giving way to some really impressive animatronics. If Jurassic Park redefined this kind of movie at the beginning of the decade, then Lake Placid is the perfect way to close it out. It’s an absurd ride from beginning to end, the kind of oddball horror comedy that you can really dig out and watch at any time without getting bored. The only regret I have with this feature is that I remember getting so excited by the ending tease and how it set up a sequel, imagining in my young mind a Lake Placid 2 about Betty White raising a whole new family of angry crocodiles. Instead, we got a slew of SyFy sequels culminating in Lake Placid vs. Anaconda. But that doesn’t matter, in the long run. We’ll always have the first movie, which was a favorite of mine in its day. It’ll always hold a special place in my heart for the sheer amount of fun I had with it as a kid. Even now, I feel like a kid again when I re-watch it, and I feel like that’s exactly what Miner and Co. set out to do.